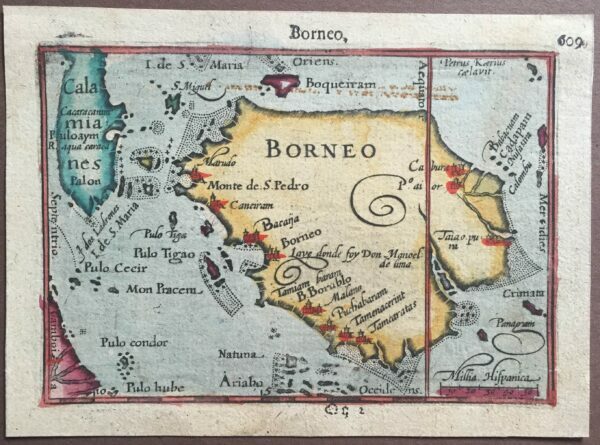 Tags: Antique Map, Asia, Borneo. Antique Map Borneo by Langenes in old colour which first appeared in the Langenes with the imprint of Langenes of Middleburg and Amsterdam publisher Cornelis Claesz. The map was engraved by Pieter van de Keere with others in the atlas engraved by his brother-in-law Jodocus Hondius. The Map Treasury had clearly drawn, finely engraved, up to date with a well written Dutch text. Langenes printed the first edition and probably wrote the text which appears on the back (verso) of the map in old Black Gothic script. The map was later re-published by Bertius in his Tabularum Geographicarum beginning in 1600 with a total of 12 appearances of the map between 1598 and 1650 in the two miniature atlases. This map is from an edition of Petrus Bertius’ Tabularum Geographicarum Contractarum. In very good condition, measures 85 x 123 mm.